I have a new pantry staple and it’s something that I never thought I would be into, but now is a hard yes: dry wide rice noodles. I always thought that wide rice noodles, or ho fun were best fresh. I mean, there’s nothing more comforting to me than the soft and chewy texture of a big bowl of beef chow fun. But, after doing a side by side test of the two, I’m in the dry noodle camp. 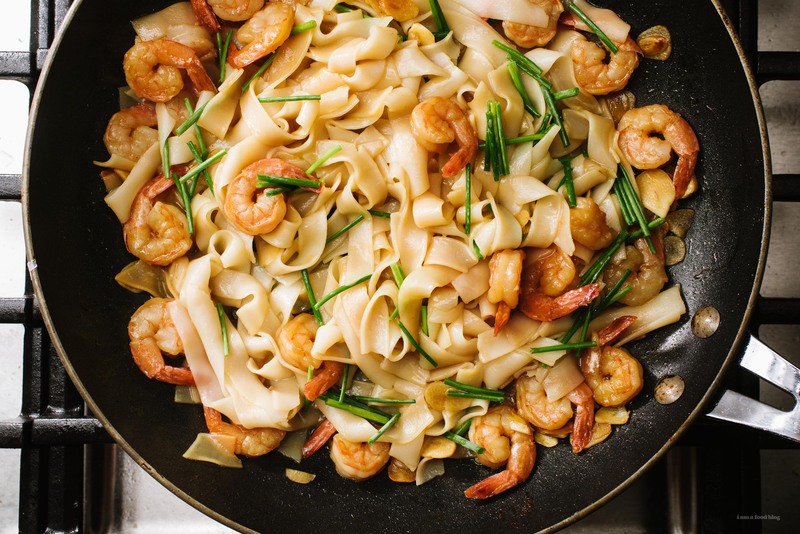 Which is incredibly convenient because that means you can throw this dish together with things without going shopping, if you have shrimp in the freezer, that is. Anyway, the weather has decidedly taken a turn for the cozy. It makes me want to make all the fall foods especially as I keep seeing Oktoberfest ads everywhere. I’m thinking I should make some more pretzels this year but then again I’m really looking forward to making a pumpkin-y stuffed shells recipe. But for now, what I’m really going to be eating is all of the noodles. 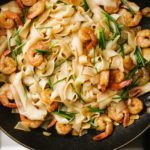 For me, wide rice noodles are one of – if not the – ultimate noodles. Wide and thin with a pleasing amount of chew, they’re perfect when in beef chow fun but also work well in most other noodle dishes. Plus they’re naturally gluten free, so if you’re looking to cut out some wheat, these are the noodles for you! Some quick tips when cooking with dry wide rice noodles: cook them according to the package, but 1 minute less. Because we’re going to finish cooking the noodles in the pan, we want them slightly underdone otherwise all of the noodles will break up and end in a tragic broken noodle pile. You don’t have to drain them super well because the starchy rice water is going to combine with the butter in the pan to create a sauce that clings and coats the noodles in goodness. Speaking of sauce, this is a simple mix of garlic, soy, and butter. If you haven’t had soy and butter together, try it, it’s amazingly good: the salty umami of soy and the creaminess of butter go hand in hand. I love this dish because it comes together so quick. Any noodle dish that is just minutes away from ending up in my mouth is a winner in my books! Bring a large pot of water up to a boil and cook the rice noodles 1 minute less that what the package calls for. 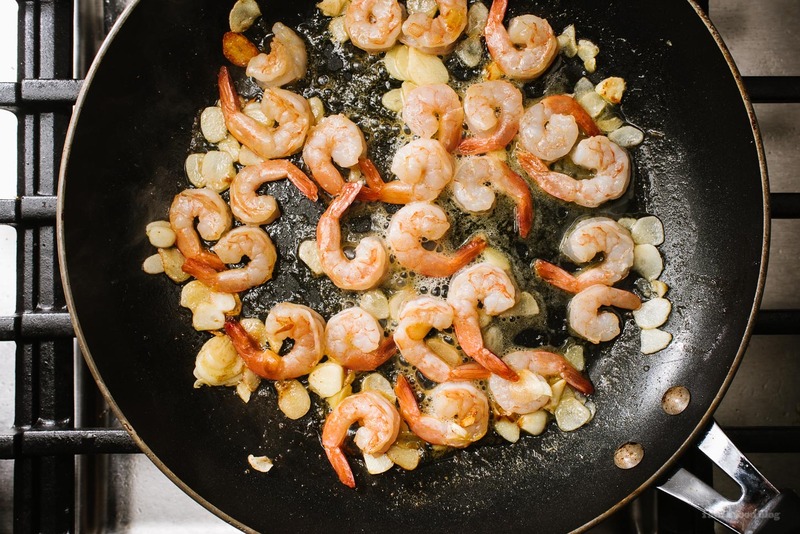 While the rice noodles are cooking, heat up the butter over medium heat in a large skillet or frying pan. When hot, add the garlic and cook, stirring, until soft but not brown. 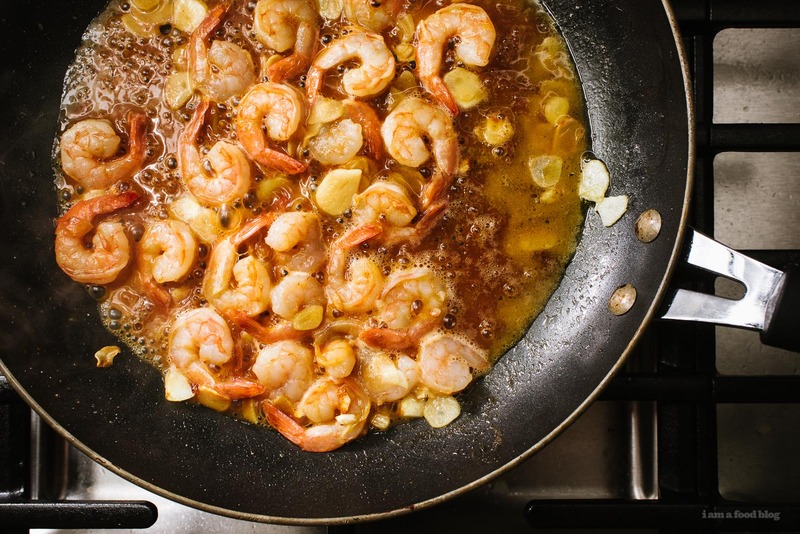 Add the shrimp and cook until pink and cooked through, flipping once. Whisk in the soy sauce and 1/4 cup of the starchy noodle cooking water. Bring to a boil over high heat. 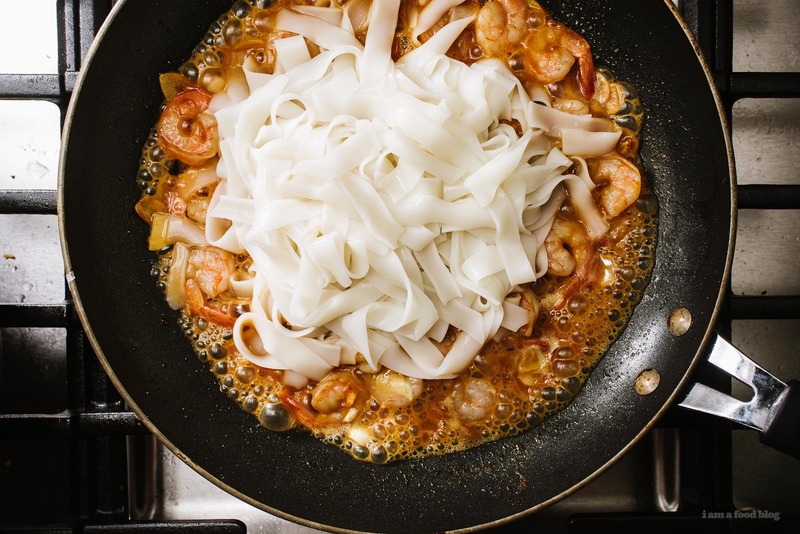 Drain the rice noodles and add to the pan with the shrimp. Toss to combine, taste and season with salt and pepper. Stir in the chives and enjoy! Love a 15 minute recipe, this Is awesome. 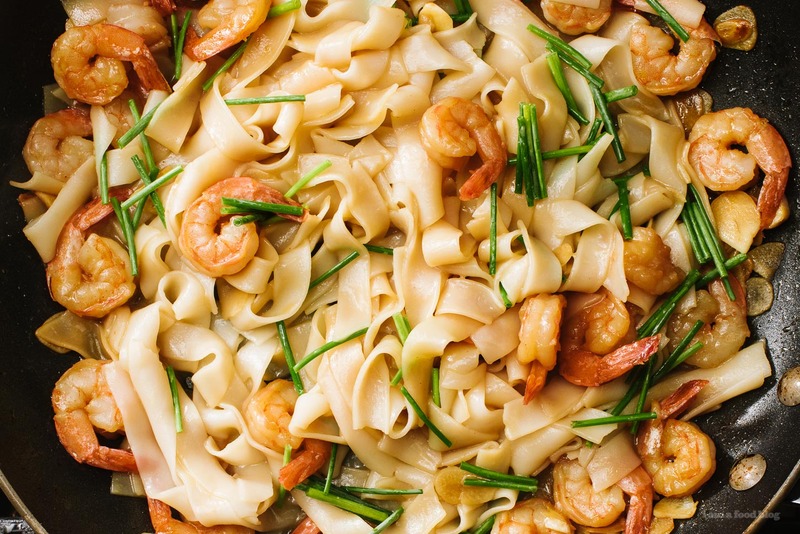 I’ve never tried dry rice noodles, but I definitely am going to! Thanks for the great recipe, Stephanie! Can this be made with egg noodles?